For some reason, quite a number of films with very strong casts in recent years have been a disappointment (at least to me), and sadly this is one of them. 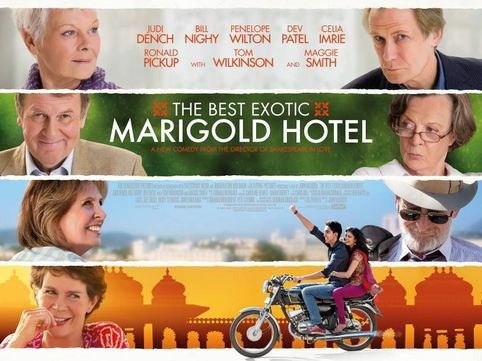 The Exotic Marigold Hotel has a very strong cast, as one can see from the poster already, but the plot is predictable. That's not where the biggest problem lies, however; many great films have simple plots but I feel that this one lacks a seamless and logical flow of events, a flaw so big and unsalvageable that even the cast cannot save it. Let me give you an example: I was clueless when Jean (Penelope Wilton), the married woman who's travelling with her husband suddenly becomes interested in Graham the judge (Tom Wilkinson) AND THEN pursues him, there's just nothing in the film that foregrounds that. The same goes for the relationship between Evelyn (Judi Dench) and Douglas (Bill Nighy); they've gone out once or twice with Graham, so not on their own, and there is hardly any communication between them. He's helped her with her tap, and then suddenly you see them developing this relationship...????? Again, no foregrounding. Not to mention how Muriel (Maggie Smith) appears to be a total invalid at the beginning of the film and at the end of it she's as healthy and mobile as anyone can be - just because of a hip operation? The film's seeable for the cast, if one is not picky about the plot, the development of events... well, basically everything else.